Today the Hartwell Tavern, typically associated with the Patriots in Lexington and Concord, invited two Loyalist regiment re-enactor corps, to educate the public about Loyalists. I spent time with members of the McAlpin and Parker regiments, learning more about the social history of the Loyalists. This is the 240th anniversary of the Battle of Saratoga. Both corps supported Burgoyne’s campaign, which ended in disaster in September, 1777 at the Battle of Saratoga. Rather than re-enacting any battles this year, the corps are focusing on the social history of the Loyalist refugees.One of the rooms was set up as to mimic what conditions may have been like. Throughout the war, Loyalists found themselves stripped of their land or in fear for their safety. Many fled to Canada in severe conditions. They recounted the story of 5 women and almost 30 children who arrived in November with just one pair of shoes between them. My ancestor lost everything and blamed the death of his wife on the rebels for driving them out of their home. 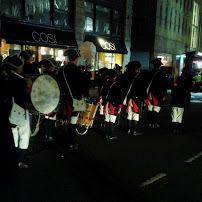 According to the re-enactors, the British government and military weren’t all that happy with the influx of Loyalists, who expected the British would help them get back their land and property in return for their loyalty. Refugee camps were set up, but no one know how to deal with them all as it was the first American refugee crisis. 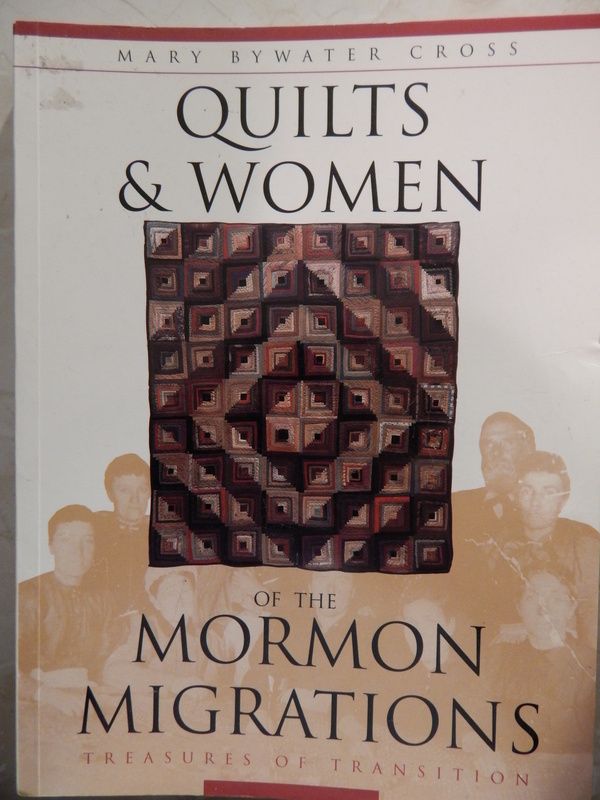 Since then there have been many: French Acadians, Native Americans, 19th century Mormons and others. 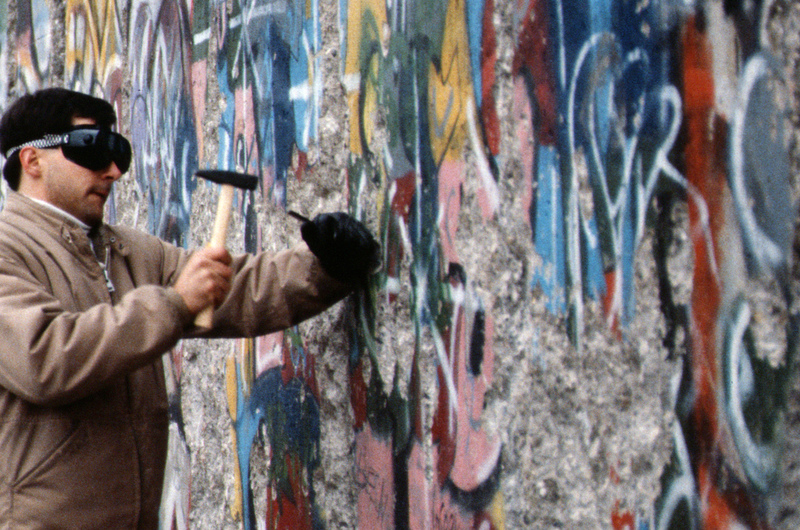 What we are seeing today with the Syrian refugees is not new. We may think of human shields as a relatively new invention, but it is not. Many male Loyalists fled, thinking their families would be safer if he was not there. The opposite turned out to be true in many cases. The rebels (Patriots)–pick your favorite term depending on which side you are on–would make it very difficult for the family left behind to leave. They had to get permission, and to quote the woman re-enactor, they were “very mean” when deciding what the Loyalist women and children could take with them. Often a mattress was permitted, while blankets were not. They thought that by keeping the wives and children of Loyalists in town would prevent the husbands and fathers from burning the town. Human shields. The American Revolution was a civil war. Family member fought against family member. Both sides committed atrocities. Meeting with the Loyalist re-enactors today was a somber reminder that history repeats itself again and again. As we focus on our family history, understanding the social history surrounding our ancestors will help us better understand them. 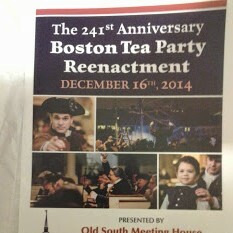 I attended the re-enactment of the Boston Tea Party on Dec 16. We were each given a program with a blue or yellow slip of paper. I later found out that the blue papers represented Loyalist views and the yellow papers represented Patriot views. 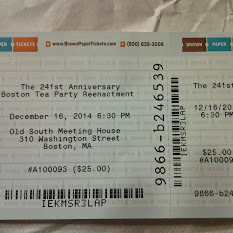 I had been thinking of my Loyalist ancestor Thomas Sumner, so was happy to have a blue piece of paper. 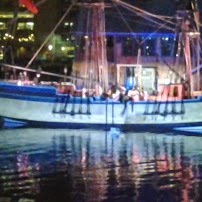 The first part of the re-enactment was dialogue between actors about how to handle the tea on the ships. If you agreed you shouted “hear, hear” or “huzzah”. If you disagreed, you shouted “fie, fie” or “boo”. 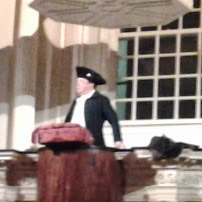 Most of the people around me were Patriots, but I stuck to my Loyalist part and, all in good fun and with lots of smiles, always shouted the opposite of my pew mates. I was trying to put on Thomas’s shoes and try to think what he would have though. It certainly wouldn’t have been in good fun for him to be in opposition to his neighbors. As far as I know, he wasn’t in Boston, but he and his family were driven out of their home in Vermont and lost all their property to the Patriots. His views would have been sincere. He was a judge, and perhaps the oaths he had taken and his occupation that involved upholding the law every day influenced his decisions. I doubt that it was an easy thought process though. Many Loyalists saw many problems with the king and Parliament, but in spite of that, retained their loyalty. All these thoughts crossed my mind as I shouted “fie, fie” or “hear, hear”. When the floor was opened up to us, I was the very first person at the mic to say my part. 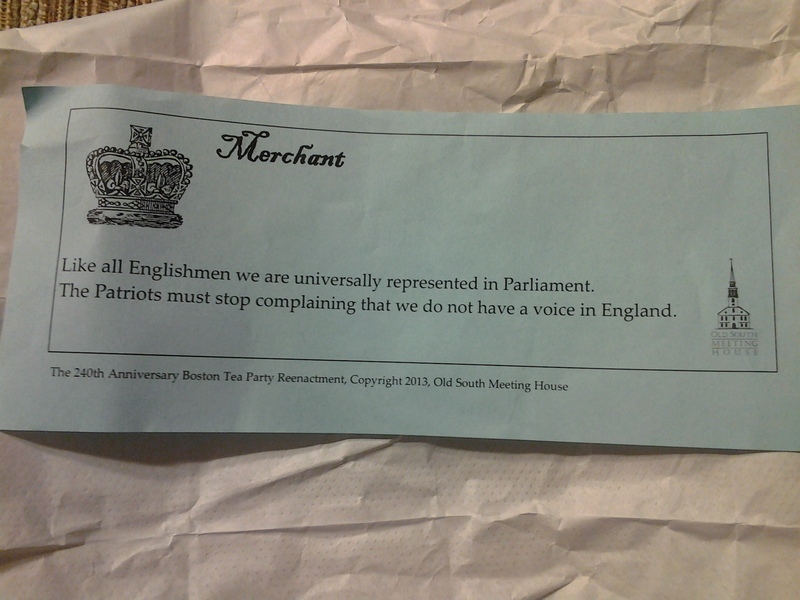 “Like all Englishmen we are universally represented in Parliament. The Patriots must stop complaining that we do not have a voice in England.” I wanted to do this to honor Thomas, who is not well known in my family, compared to our Patriot ancestors. Throughout the night I posted on Facebook as if I was a Loyalist. 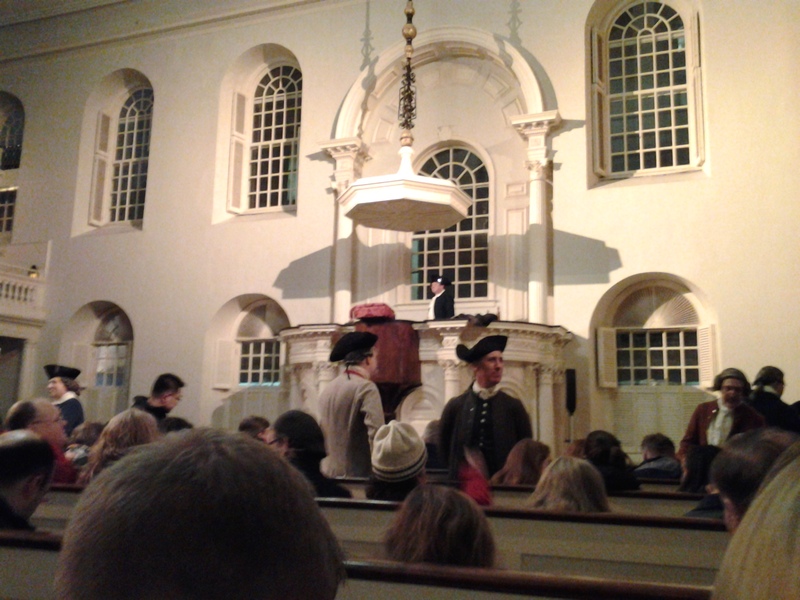 As we left the meetinghouse and marched to the harbor behind a fife and drum corps (fun but not authentic), I continued thinking of what Thomas would have thought if he had been there. Would he have even gone to the harbor? Would he have tried to stop the ship raid? Since he wasn’t there, what did he think when he heard the news? As I watched the Patriots throwing the tea into the harbor, the part of me that was channeling Thomas thought “you bloody fools!”. While perhaps nobody could know what would happen only 15 months later in Lexington and Concord, many feared that this would happen. 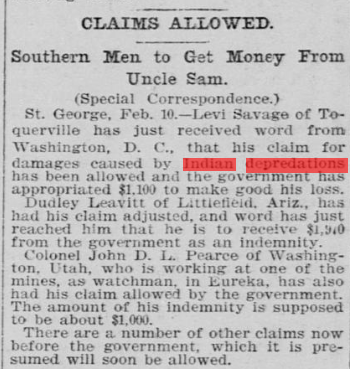 Thomas may have been among those. This was such a wonderful experience for me to put myself into an ancestors shoes. While I certainly don’t know what he was thinking and feeling, I could make some educated guesses that helped me see a historical event from a different perspective than I had ever seen it before. I am so glad I received that blue paper! 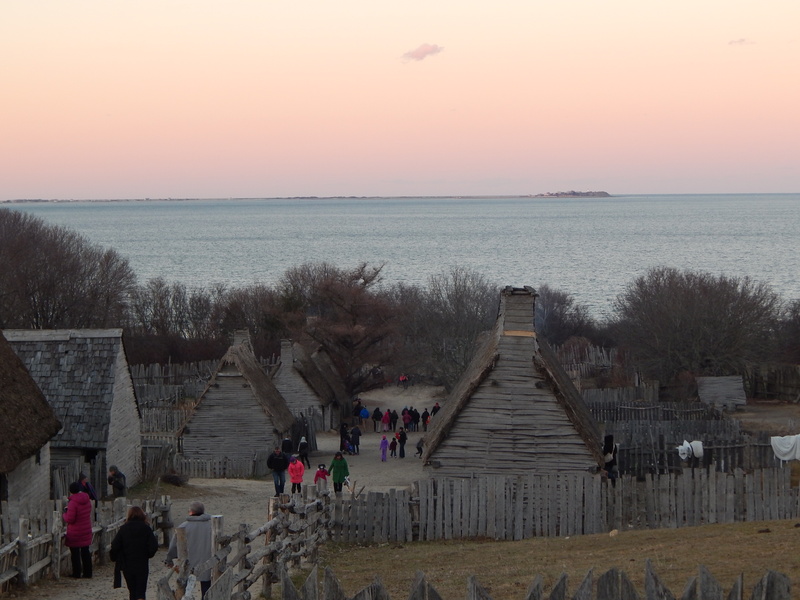 This year I finally did something I have wanted to do for years: I attended the Harvest Dinner at Plimoth Plantation. 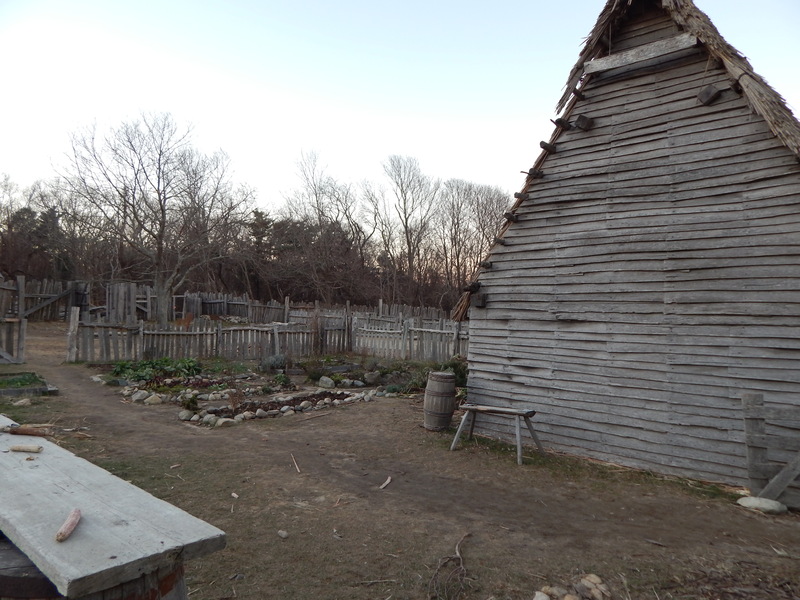 For those not from this area, Plimoth Plantation is a living history village set in the year 1627. The interpreters each take on the role of one of the people that lived in the village in 1627 and do not break that role. 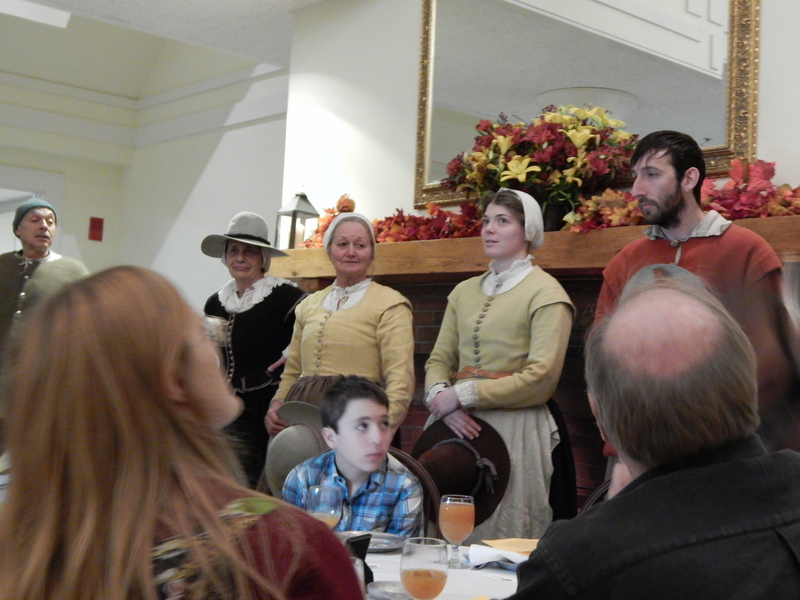 Plimoth Plantation offers Thanksgiving dinner as well as a harvest dinner. 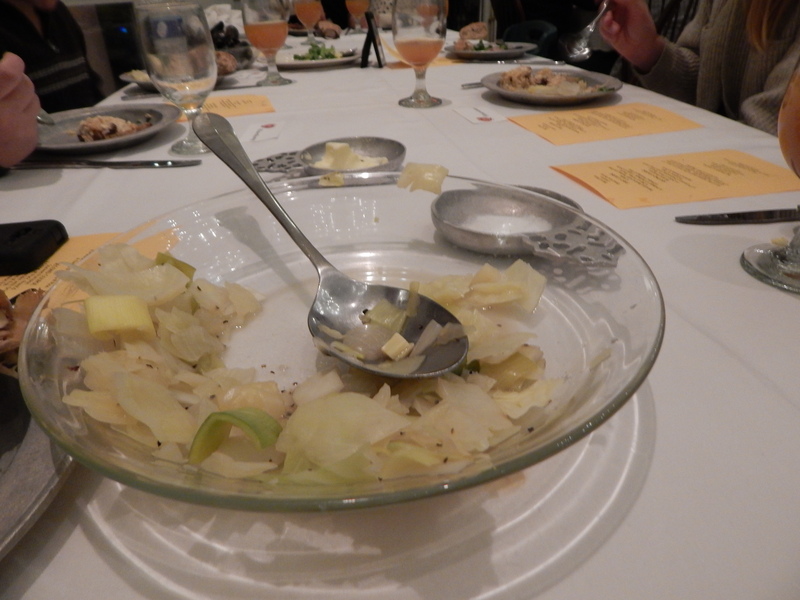 Since the harvest dinner is closest to what the Pilgrims would have eaten, and I wanted an authentic experience to bring me closer to my ancestors who lived during that time period, I chose the harvest dinner. It was a bitterly cold day and I braved the village just to get myself in the mood and to have some sympathy for my ancestors who didn’t have the warm clothes that I have. The buildings were drafty. The dinner was wonderful. Lots of meat and fish. 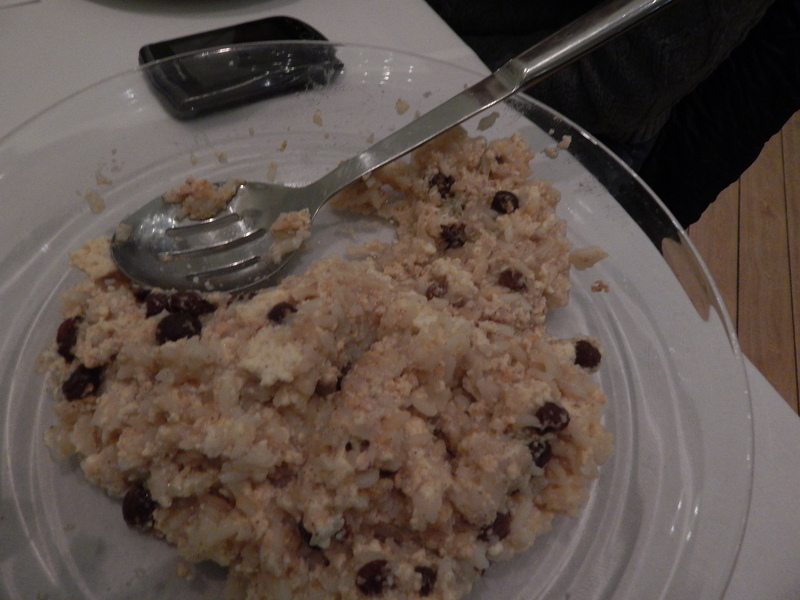 My favorites were a rice pudding and a cabbage dish. 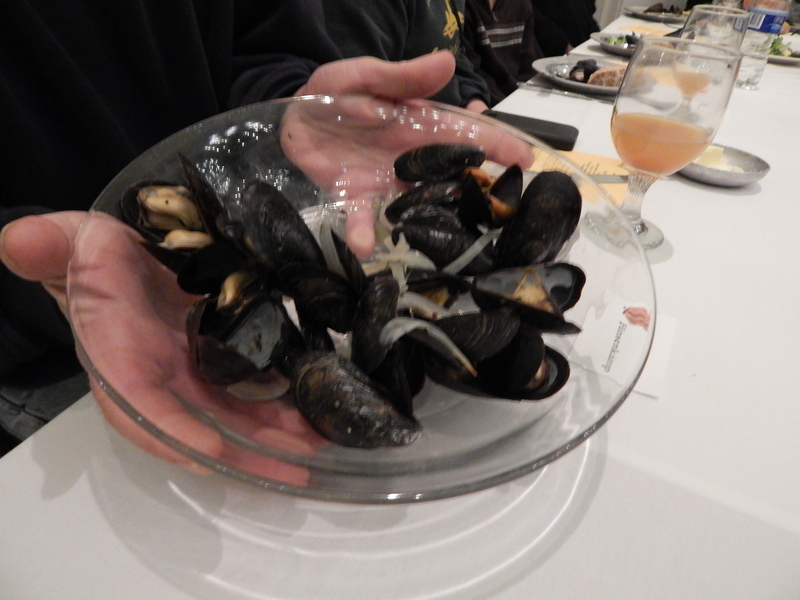 I don’t usually like seafood, but the mussels were delicious. We even had some of the interpreters providing entertainment and conversing with us. The full menu can be found here. Recipes can be found in the Pilgrim Seasonings blog written by Kathleen Wall of Plimoth Plantation. It was a wonderful experience and I am glad I was able to “walk” in the shoes of my ancestors. What experiences have you taken advantage of that allowed you to walk in the shoes of your ancestors?